The reinforced, prestressed concrete bridge will be part of a new section of ring road around Gemert. It is being built by BAM Infra. The university said that one of the advantages of printing a bridge is that much less concrete is needed than in the conventional technique in which a mould is filled. By contrast, the printer deposits the concrete only where it is needed. As well as environmental benefits in materials savings, the technique allows freedom of form as the printer can make any desired shape. 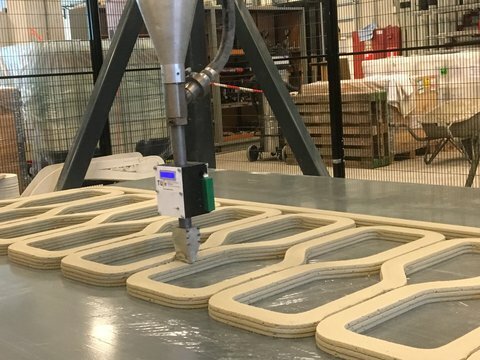 The researchers in the group led by Theo Salet, professor of concrete construction, have succeeded in developing a process that also prints the steel reinforcement at the same time. When laying a strip of concrete the concrete printer adds a steel cable so that the bridge is prestressed. The research group initially made a scale model (1:2) and tested its safety by subjecting it to a 2,000kg load. Now that the safety has been demonstrated, a start is being made on printing the concrete elements that will later be glued together to form the bridge. It is expected that the bridge elements will be printed and ready within two months. In September, BAM will put the bridge in place in the Noord-Om, a new section of ring road around the village of Gemert. Others involved in the project are engineering firm Witteveen & Bos, the province of Noord-Brabant, the municipality of Gemert-Bakel, Saint-Gobain Weber Beamix, Dywidag-Systems International, Verhoeven Timmerfabriek and Bekaert.